Australia warmed up for their eagerly anticipated clash with England with a 65-3 demolition of Uruguay at Villa Park. The Wallabies have nine points alongside Wales at the top of Pool A and victory over England at Twickenham on Saturday could end the hosts' hopes of a knockout place at their own tournament. Wales, who beat England on Saturday, lie in wait a week later at the same venue for an Australia side who waltzed past minnows Uruguay, scoring 11 tries in a match which was far removed from what awaits next. Swing Low, Sweet Chariot was sung by the Villa Park crowd as a reminder of what is to come for Australia, whose tries came from Ben McCalman, Drew Mitchell, Sean McMahon (all two), Joseph Tomane, captain Dean Mumm, Henry Speight, Matt Toomua and Tevita Kuridrani. Quade Cooper was successful with five from 11 kicks at goal and was sin-binned after 15 minutes after needlessly man-handling Uruguay scrum-half Agustin Ormaechea. On this evidence - and despite some sublime skill in attack - the enigmatic fly-half is unlikely to be trusted for the big games to come. Australia head coach Michael Cheika is likely to revert to his first-choice line-up after making 14 changes in Birmingham from the opening win over Fiji, when they missed out on a potentially crucial bonus point. The bonus was secured inside 30 minutes this time against a Uruguay side which started with a 54-9 defeat to Wales. It might have come sooner had Kurtley Beale and Mitchell not fluffed a near-certain try after the full-back burst down the wing from a lineout in the opening minute. His pass was too high and Mitchell fumbled with the line gaping and it was not always a fluid performance from the Wallabies. A try soon followed as the pack took the direct route with a catch and drive from a lineout which concluded with McMahon nipping round the blindside to score on the left. Cooper missed the conversion attempt, but then his neat offload set Tomane free to touch down in the right corner. The Wallabies No.10 next threw Ormaechea down like a rag doll, when the scrum-half had already offloaded the ball, and was deservedly sent to the sin-bin. Not that the numerical disadvantage hampered Australia unduly against limited opponents in their first World Cup in 12 years and third in all. Felipe Berchesi kicked a penalty after a late tackle by Will Skelton while Cooper was in the bin and, on his return, Mumm sauntered through out wide. 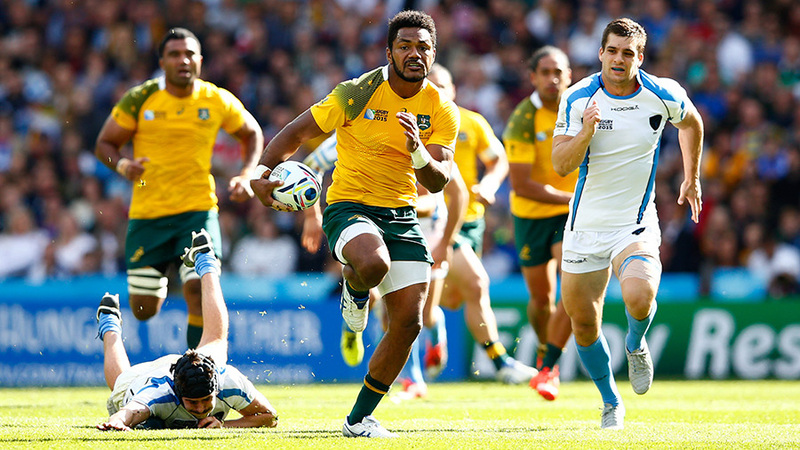 Speight leapt over after the ball was spread through the hands for Australia's fourth try. Next McCalman accepted a sublime inside pass from Cooper to ghost in under the posts. Cooper added the extras for a 31-3 half-time lead. Mitchell scored two tries in six second-half minutes, first scything through the Uruguay defence with ease and next completing an overlap. Australia punched up through the centre and then made the most of extra men outside as McCalman claimed his second. McMahon emerged from the bottom of a heap of bodies after another catch and drive for Australia's ninth try and Toomua crossed for a 10th after Cooper's dart. Uruguay's pack searched for a try late on, but coughed up the ball in a promising position and Kuridrani crashed over out wide for another Australia score.